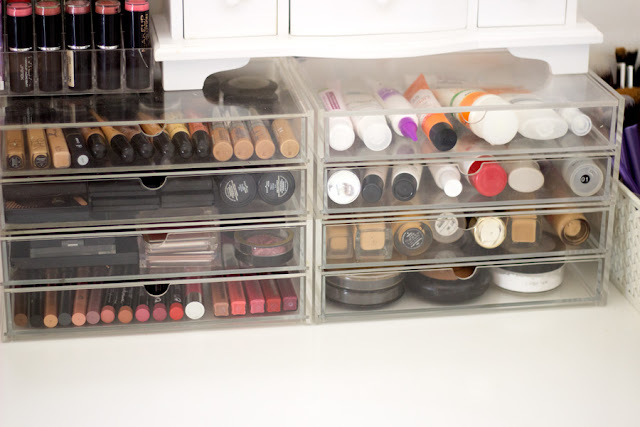 The last time these babies were featured in a post was when I showed you all my makeup collection and storage here, here, here and here. I have since switched things around as expected from anyone obsessed with anything beauty, makeup and blogging. 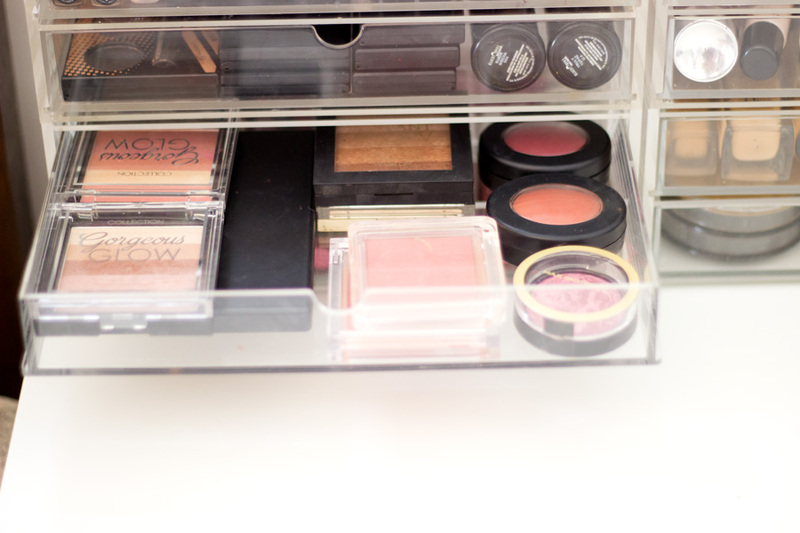 I love giving my makeup station a makeover every now and then although I don't really do anything too drastic. I have been putting off buying more Muji Acryllic Storage drawers because it is tempting to attempt to fill them with more makeup when you purchase them. Anyway, I eventually got two more sets of drawers because I was finding it a little difficult to see all my makeup at a glance. 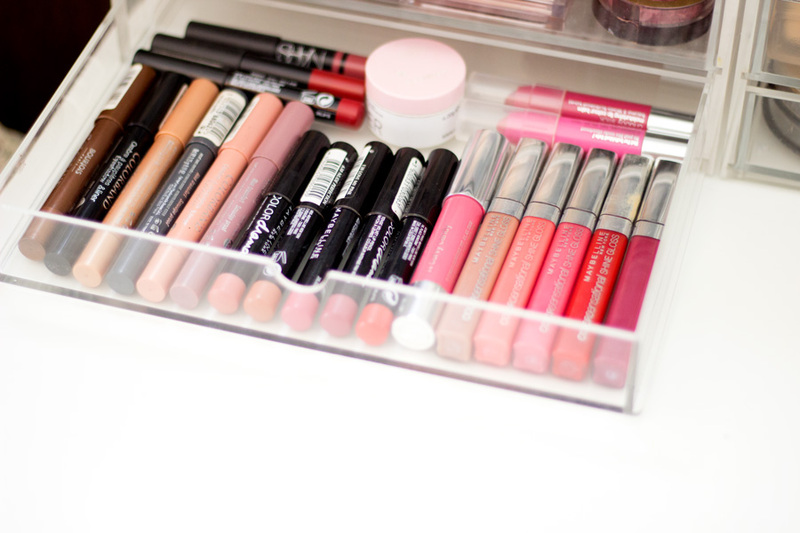 I prefer to have everything in a single layer rather than stacked (if I can help it) so all my makeup have a chance of being used. I also did an overhaul of many beauty items which I wanted to give away and I now have products I know I cherish and would get a lot of use from. It still looks a little excessive for an average non-blogger but I don't think it's too bad for a regular blogger who loves makeup :-). 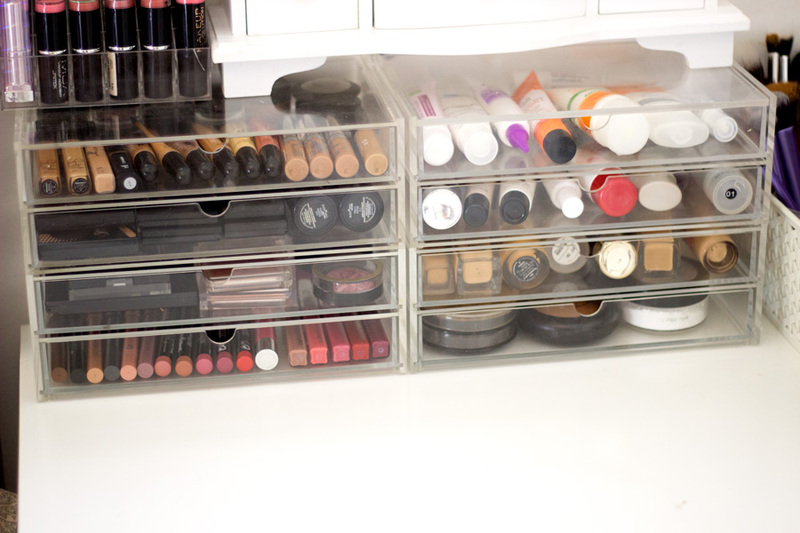 Right, I need to stop blabbing and show you my updated Muji Drawers content. I am considering filming a makeup collection video so if you want to see my entire collection including my Muji drawer, then let me know. 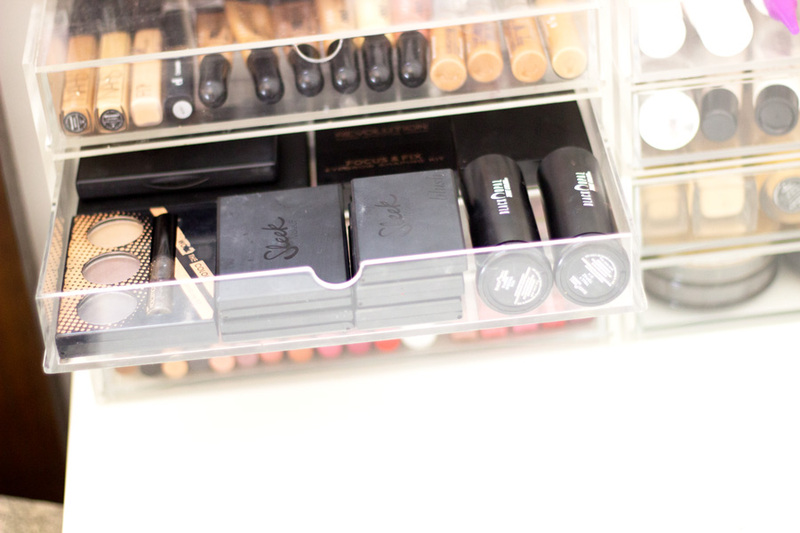 My Muji Drawers are from...well you guessed it...Muji Stores. I bought all but one of these drawers from the Muji counters in either Selfridges London and Trafford Centre Manchester. I got the last one from a stand alone Muji Store in London. I have two types of these drawers although they look similar. The first three are called the Wide acryllic drawers which have two set of drawers each. They retail for £10.95 which I is such incredible value because they are very sturdy. The second type I have is similar to the Wide Drawers but the top has a flip which is handy. This particular one is broken because I was careless however I have my vanity on top of it so I never really open it. 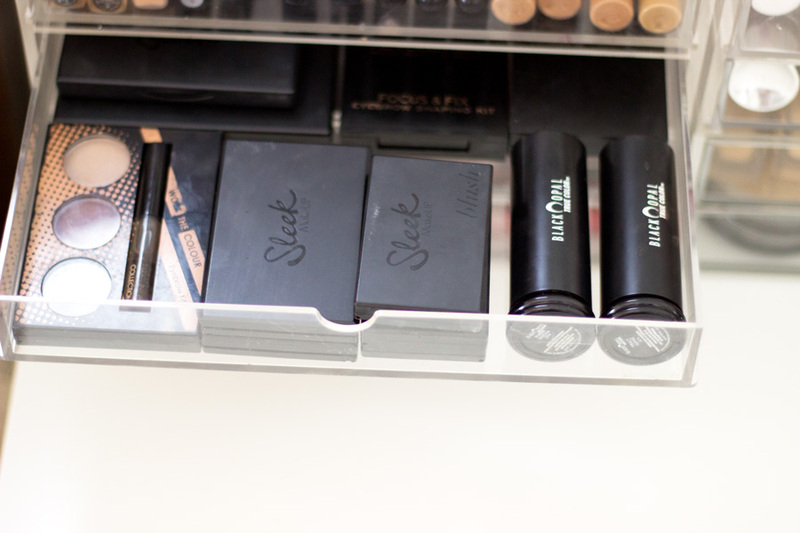 I tried to fit my loved products all into the Muji drawers but it was not happening so I just fitted in as much as I could in here and the rest in my IKEA Desk drawer. I have two little towers made up of four drawers each. First Drawer (Skincare): This is my skincare drawer which houses all the skincare I currently use. I try not to be too fussy or experimental with my skin so I stick to products I know have worked for me. Most of the products I am using are drugstore and I am well surprised at how efficient they are. My top skincare priority is to get rid of the hyper pigmentation I have on my face courtesy of my annoying acne from previous years and to continually prevent future acne. I always have La Roche Posay Effaclar Duo* and A.I*. 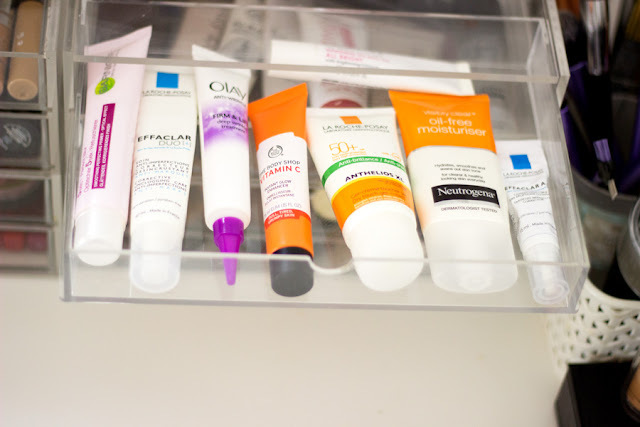 in my skin care stash because they absolutely work for my skin. I have used them for years now and they have never let me down. I use my Neutrogena Oil Free Moisturiser which is another HG of mine and I have repurchased it countless times because I use it in the morning and night. I recently added the Body Shop Vitamin C Glow Enhancer* to my collection and I have been enjoying it as it acts as a glow enhancer and primer. Another dual purpose product I am enjoying is the Garnier Perfect Blur which is so good at priming the face and blurring my pores. I have also started taking care of my eyes now so I don't have to worry too much when I am older. I have two eye creams for my under eye circles- the Boots Botanics Eye Roller gel for puffy eyes and Olay Deep Wrinkle Treatment for some fine lines under my eyes to prevent them from getting worse. 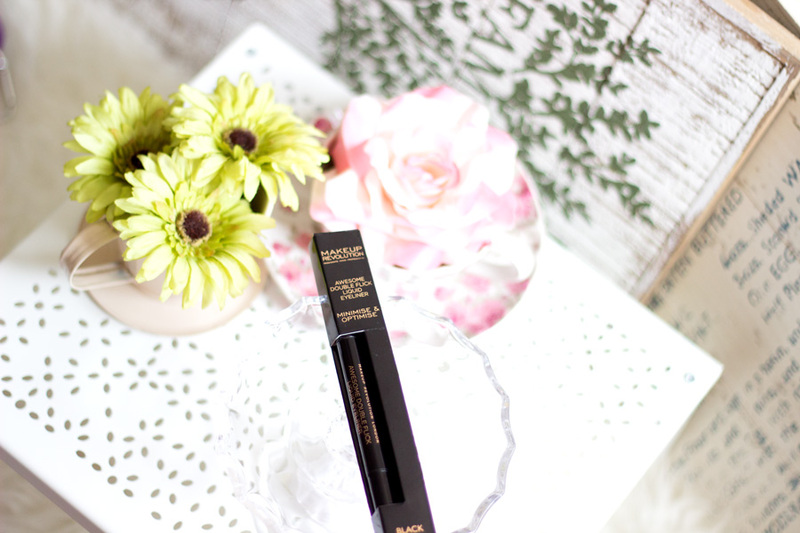 It seriously works as I have noticed an improvement in one or two fine lines under my eyes. 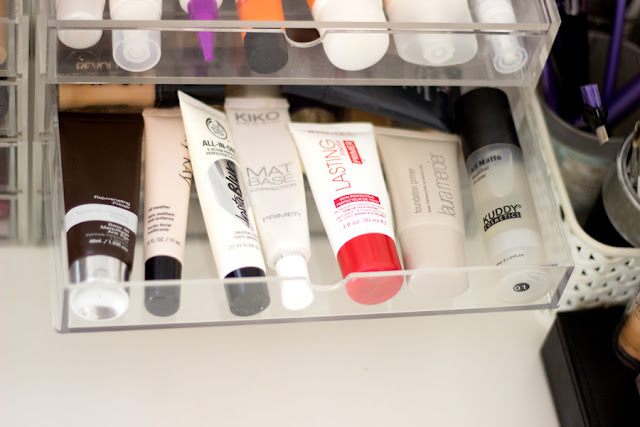 Second Drawer (Primers): I recently did a post on my Primer collection which I would link here. I love primers and I can't remember when last I ever used any foundation without a primer. My skin is combination oily and if if don't use a primer, it just slides right off or gets super shiny. My favourite all-round primer is the Laura Mercier Foundation Primer and the Becca Rejuvenating Primer. I love the Rimmel Lasting Finish Primer as a good drug store alternative. For mattifying my skin, I always opt for the Kiko Matt Base Corrector Primer ,Kuddy Cosmetics Mattifying Primer* and the Mary Kay Mattifying Primer. When my pores need to be well blurred for photos or filming, I opt for my silicone based primers including the Superdrug B.Prepared Primer and The Body Shop Instablur Primer. 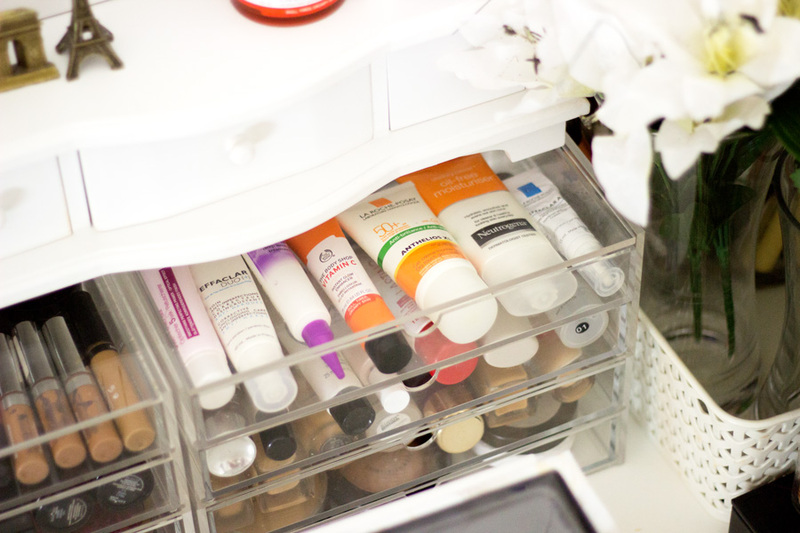 Third Drawer (Foundation): It’s no secret that I am a foundation junkie and I have come to accept that my love for foundations can never be satisfied. 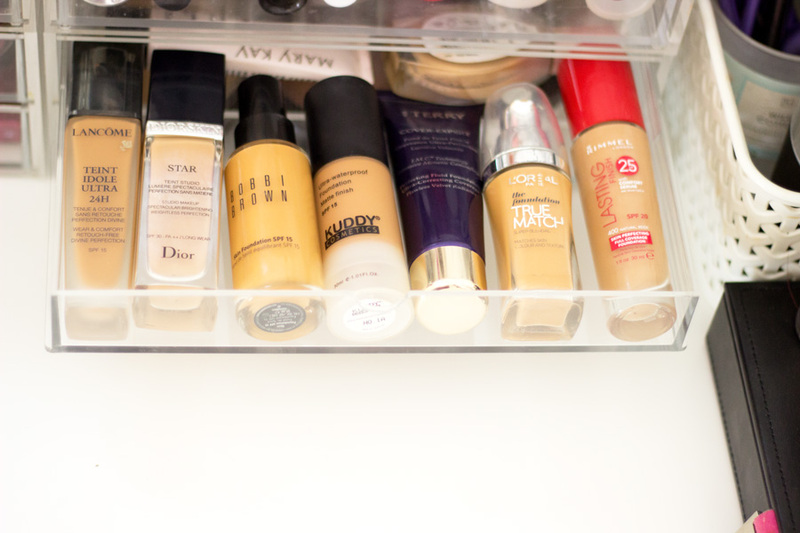 I am forever on the haunt for the perfect foundation which always seems to be elusive. 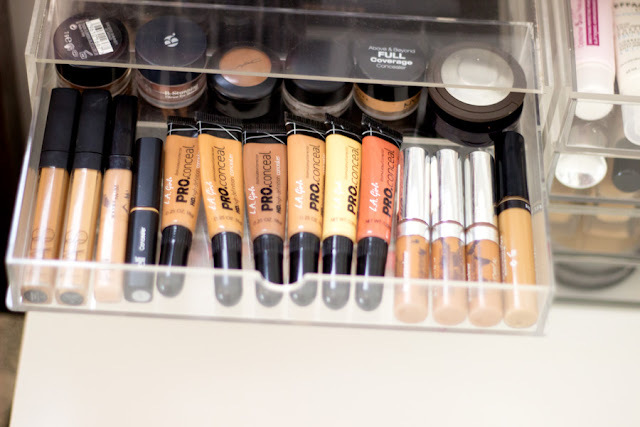 I have also refused to count how many foundations I have in my collection; I have more that don't fit into my Muj Drawers on the side ( don’t bother counting them...hehehe). I have featured my thoughts on my high end foundations here and drug store foundations here. To be fair, some of these foundations are on their last leg and I am just waiting to use them a few more times before they are finished e.g. Mary Kay Timewise Foundation and the Kuddy Cosmetics Mattifying Foundation. 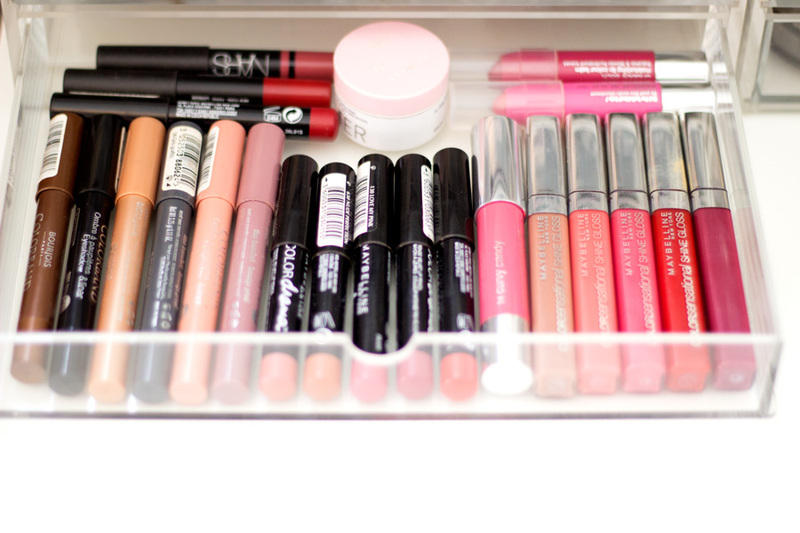 I love looking at the drawer and I have no idea why (it just looks pretty, no?). I have reignited my love for my Bobbi Brown Skin Foundation which has been amazing this spring. From L-R I have: Lancome Teint Idole Ultra Foundation, Dior Star Foundation, Bobbi Brown Skin Foundation, Kuddy Cosmetics Foundation, By Terry Cover Expert Foundation, Rimmel Lasting Finish Foundation and L’Oreal True Match foundation. 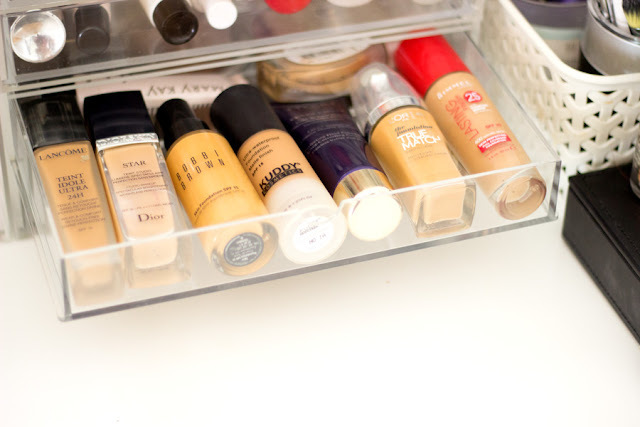 Hidden at the top, I have Mary Kay Matte Timewear Foundation and Maybelline Fluid Touch Foundation. 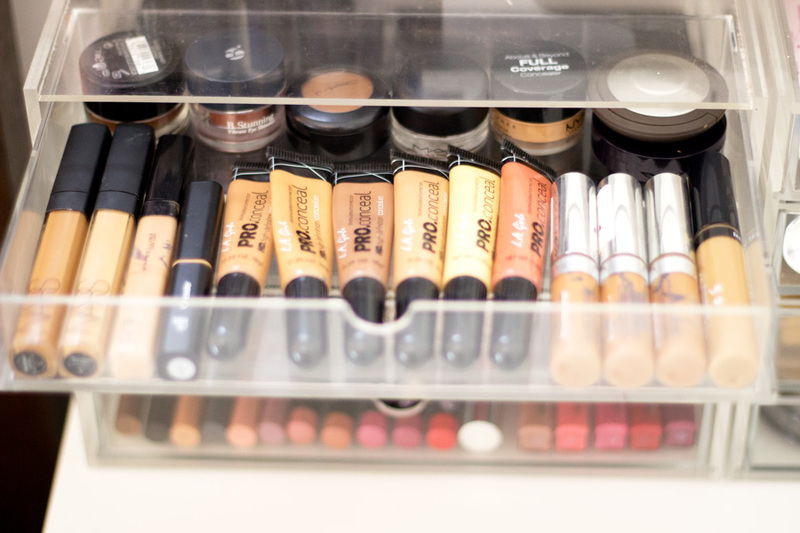 I plan to do a foundation post telling you all about my shades if you wish. 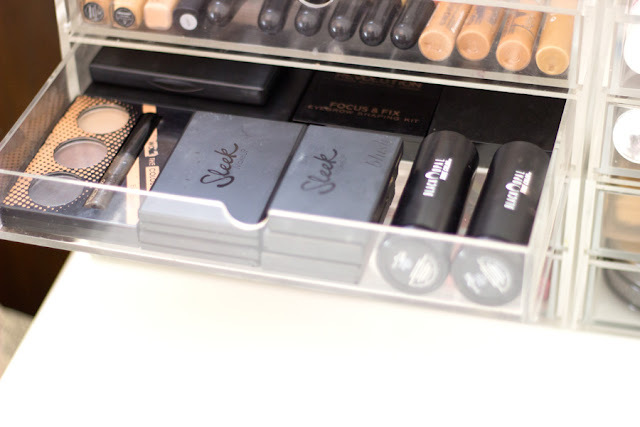 Fourth Drawer (Finishing Products): I like how spacious and neat this drawer look and I can find all my products easily without stressing or making a mess. Here, I store all my finish products like Powders, Bronzers/Highlighters, HD Powders, etc. I can’t think of any product in here which is not used at least once a week. They are all functional and I love how versatile they are for various uses. I have two MAC Mineralize Skin Finish in Dark and Medium Deep which is amazing for finishing off my makeup and giving me a flawless look. I also have two Collection Powders in Translucent and Warm Bronze. I use the Warm Bronze to put back some colour in my face when my foundation looks pale, dull, ashy or beigey (the worst of all). I use the translucent to set my under eye concealer and to mattify my face and it’s seriously amazing (and underrated). 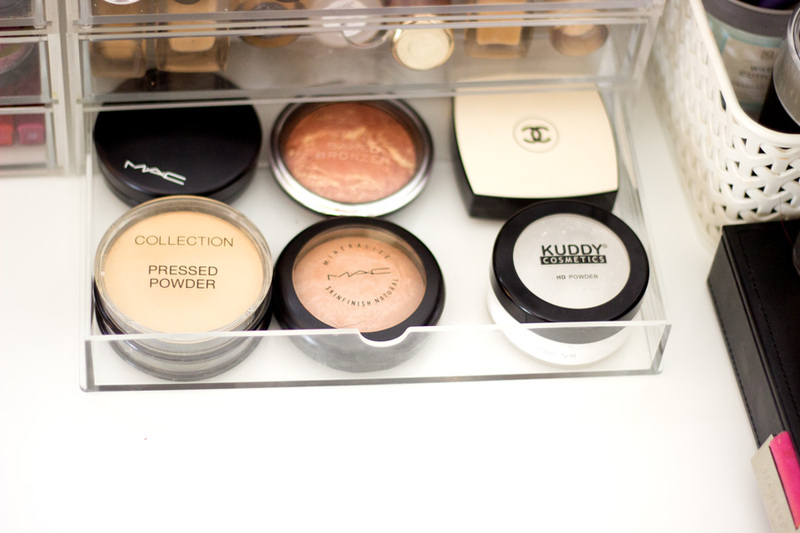 I also have the Kuddy Cosmetics HD Powder* which I always use on my T-zones before I head out of the door to prevent any unwanted shine. 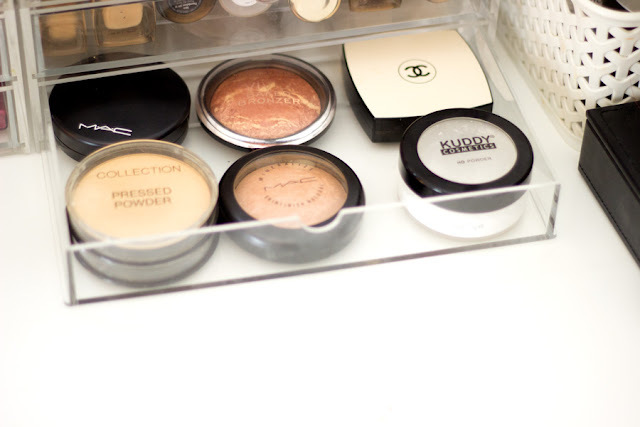 I also have my Chanel Les Beige Powder which I use for special occasions and when I am going to a really nice event. 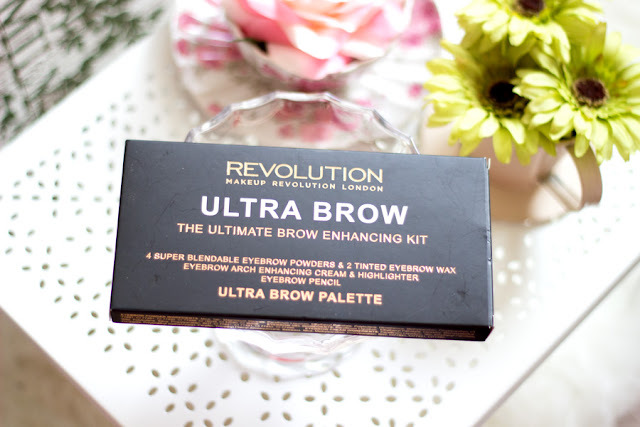 It’s always nice to just pull it out of my clutch as it is such a luxe product. 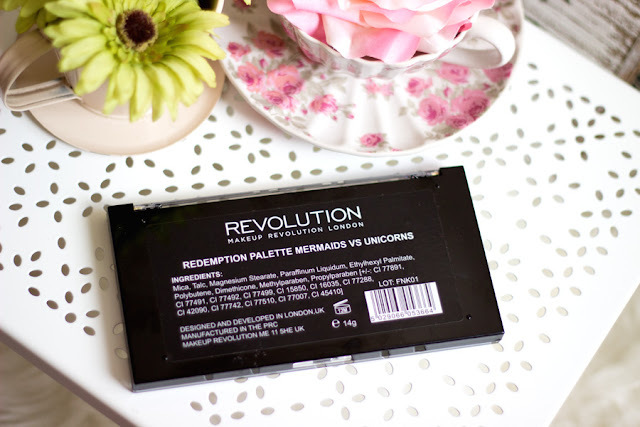 Lastly, I have the Makeup Revolution Baked Bronzer (it’s really a golden highlighter which is seriously pigmented) and I love using this especially now that Spring and Summer is upon us. First Drawer (Concealers): I never used to be a concealer girl; in fact I only had one or two concealers. However, when I discovered how amazing they were and how they reduced the amount of foundation I used, I was sold. Now, I classify myself as a borderline concealer junkie and I have a little collection here. I recently added some more L.A. Girl HD Concealers to my stash (more Fawn, Toffee and Cool Tan) and also some correctors (Yellow and Orange). I have decided to let go of how annoying the packaging is and concentrate on the content/product. Their quality is very comparable to many high end concealers. 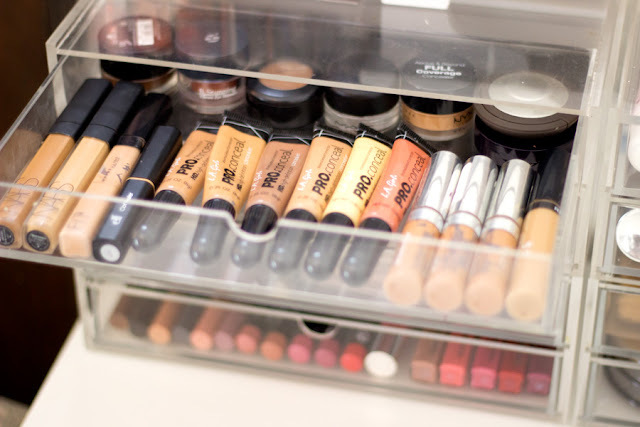 From L-R, I have NARS Radiant Creamy Concealer in Amande and Caramel, Maybelline Fit Me Concealer, LA Girl Pro Concealers (Fawn, Toffee, Cool Tan, Toast, Yellow and Orange Corrector). At the inner top row, I have MAC Studio Finish Concealer, NYX Above and Beyond Concealer, Estee Lauder Stay in Place Concealer, Becca Dual Coverage Concealer. 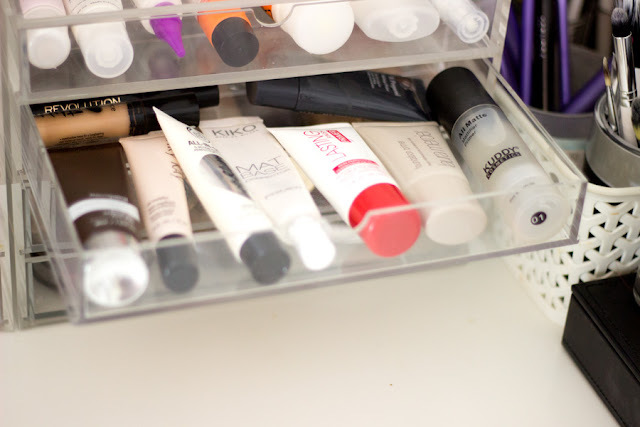 I also have some products that are not concealers in there but they are easier to reach for in this drawer. They include MAC Fluidline Eyeliner Gel in Dipdown, Super Drug Cream Eyeshadow and Mac Factor Excess Shimmer Eyeshadow in Bronze. Second Drawer (Contours/Bronzers): I think I should just rename this drawer to the Sleek Makeup drawer because majority of the products in here are from Sleek. I spoke about them here if you want to know about any particular product. Anyway, I have all my contours, little blushes and bronzers/highlighting in here. 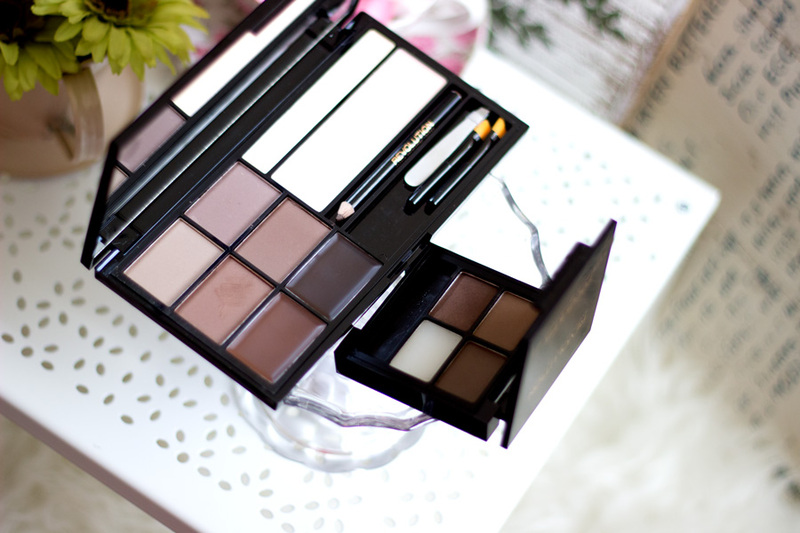 At the back, I have my Sleek Face Form and Sleek Corrector and Concealer Palette which I love. Next to it, is my Sleek Contour Kits in Medium and Dark and I had to get two because I prefer the highlighter in the Dark Kit. The one in the Medium kit does not look right on my skin. 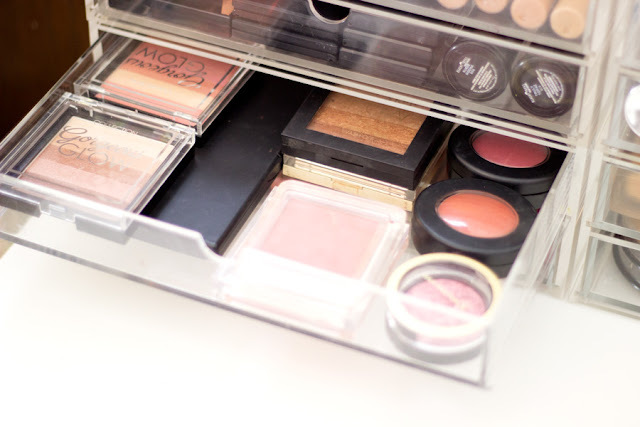 I also have a few Sleek Blushes in Rose Gold, Sahara and Peach. I love how small and compact they are. At the bottom, I have my Black Opal True Colour Foundation Stick in Suede Mocha (for contouring) and in Truly Topaz as a normal foundation which I am trying out. 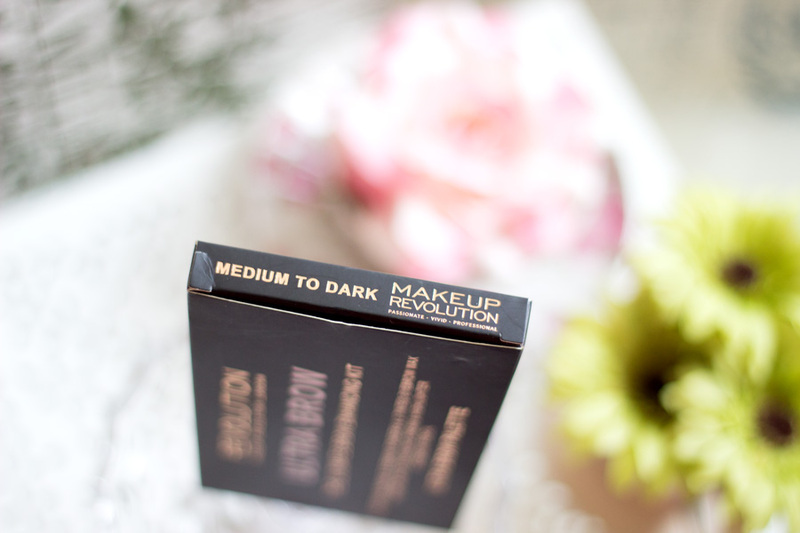 I love how all the product packaging are black as it just looks classy and well planned. 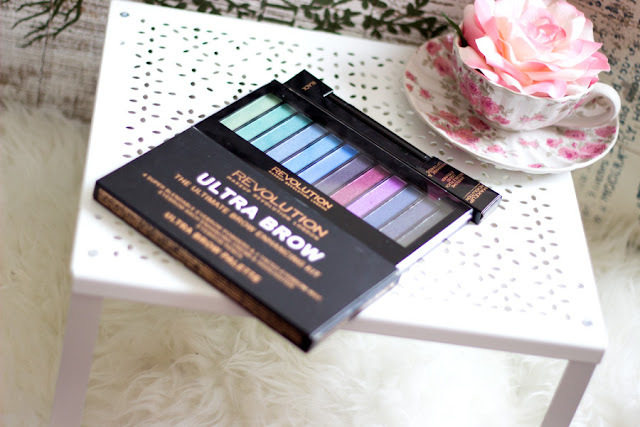 I also have some brow kits in there including the Makeup Revolution Brow Kit and the Sleek Brow Kit and I love them both although I use the Sleek version more often. 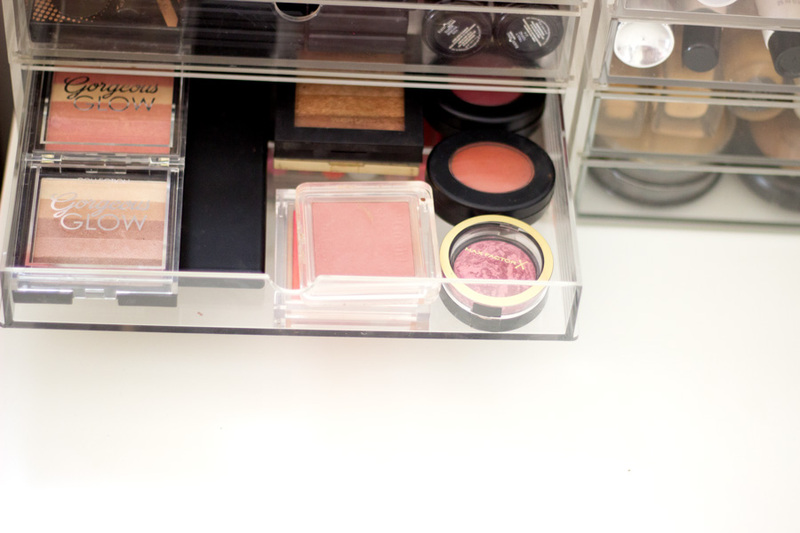 Third Drawer (Blushers): I am not really a blush girl and I used to skip it for a really long time. However, I am now getting into the flow but not enough to go crazy. I have one of my favourite blush palettes from Kuddy Cosmetics called the Blush Crush Palette which I absolutely love because it has all the shades I ever need. However, I still went ahead to purchase more blushes because I love to try new products. I have three single blushes including Max Factor’s Creme Puff Blush in Gorgeous Berries, &Other Stories Blush in Pink Caddage, Essence Blush in Heat Wave (my spring fav) and two Black Opal Blushes in Cayenne and Whispering Petals. The Black Opal blushes are seriously pigmented and I have never used anything like them at all. 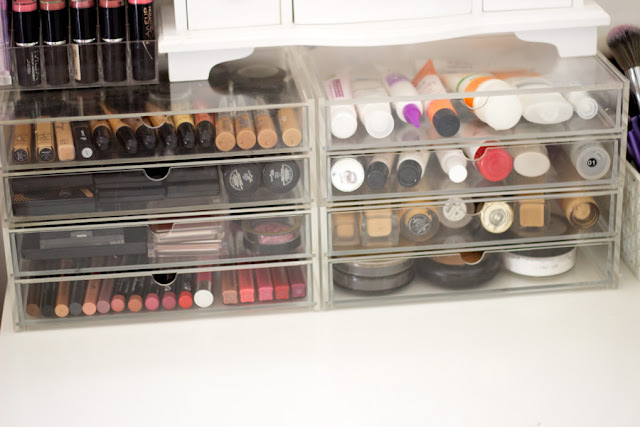 Fourth Drawer (Lip Products): I have always wanted a separate drawer to store my lip glosses because 1) The products look so colourful and pretty and 2) I can see all I have at a glance and use them accordingly. I am so pleased with this arrangement because I found it a lit bit difficult choosing what I wanted to use because they were all stacked on top of each other. I won’t go through all the products because that would be tedious. I have my Bourjois Color Bands Eyeshadows/Eyeliners, Maybelline Color Drama Velvet Lip Pencils, Maybelline Color Sensational Lip Glosses and Clinique Chubby Stick in Curvy Candy. 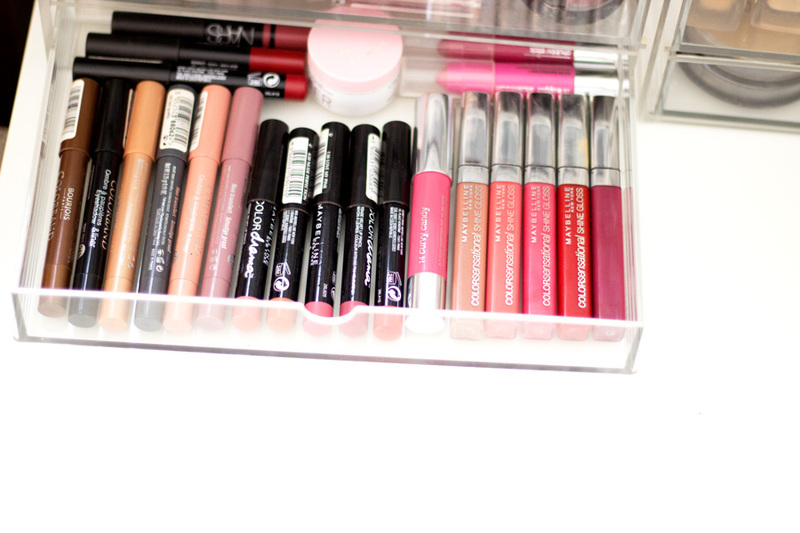 At the back of the drawer; I have my NARS Mini Lip Pencils, Korres Lip Balm in Jasmine and Mini Clinique Chubby Lipsticks. I really love how colourful this drawer is and it’s also one of my favourite drawers. 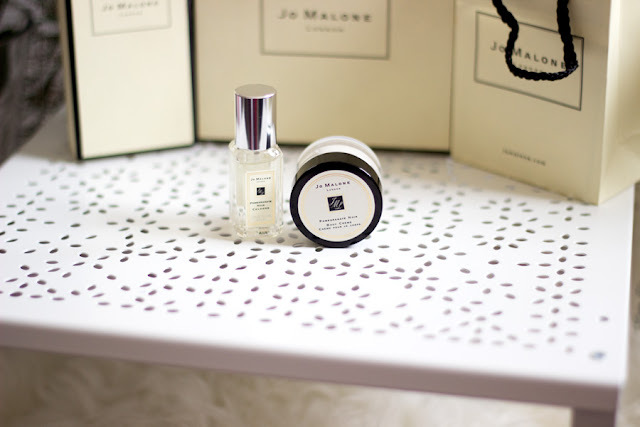 I think I stumbled across Jo Malone about three years ago in John Lewis and I really wanted to purchase one but the price was just way too expensive. I knew I would revisit it soon but not at that time when I had other priorities. 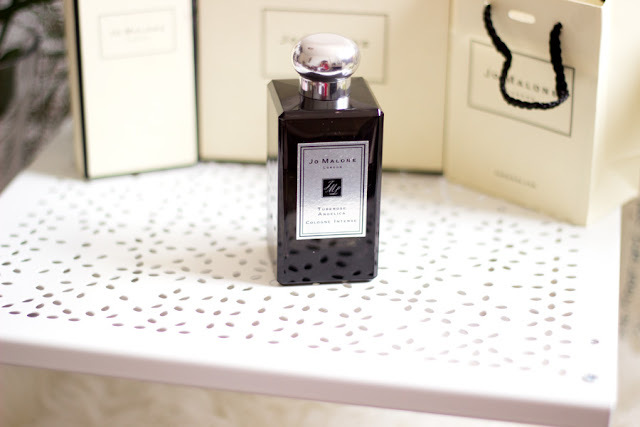 You can imagine my delight when my friend and flatmate gave me my first Jo Malone Perfume- Pomegranate Noir which I reviewed here. I believe it is still one of Jo Malone's best selling fragrance and it is so unique. I still have it with me and I don't really want it to get finished. Since then, I have become slightly obsessed with Jo Malone fragrances and every other product they make. 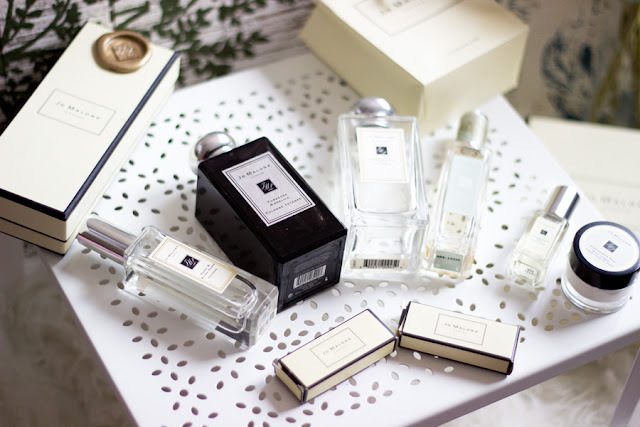 I started a little collection of these Jo Malone fragrances and it is indeed not an easy feat because they are quite pricey. 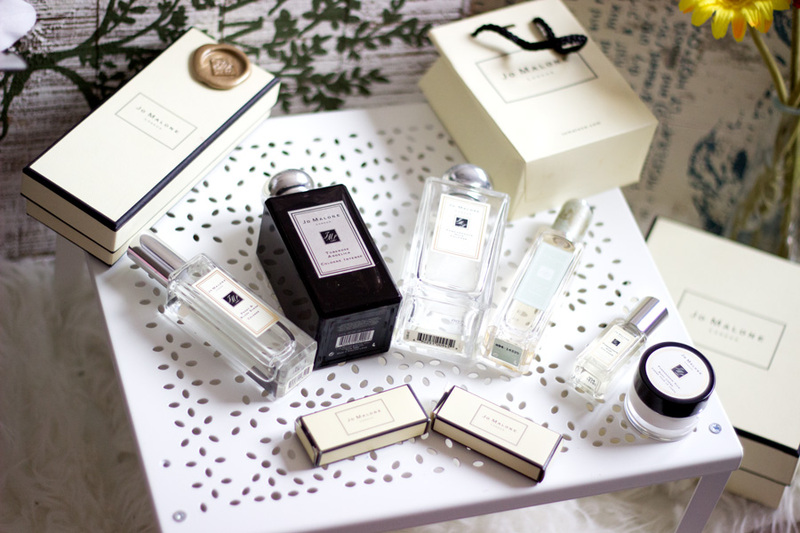 I have to mention that I am very lucky that I only ever purchased one of the Jo Malone fragrances in this picture - The limited edition Lily of the Valley which was from the Rock of Ages Collection. All the others were given to me by my loved ones which I am very grateful for. I realise that I love fragrances that have some kind of musky, floral scent to them with a light hint of a fruity zest. I definitely gravitate towards these kind of scents when I pick out my fragrances although I love fruity scents during Spring/Summer. So, let's get into my collection. Majority of them already have their own reviews so I would link them where relevant. I am not going to describe these scents, their notes and all that malarkey in this post rather I would attempt to describe how these scents make me feel. As mentioned earlier, this was my first Jo Malone Perfume or Cologne as they are called and I fell in love with it immdiately. I always reach for this during Autumn/Winter although I am pretty sure it can be worn all year round. I just prefer to wear it during these seasons. I also grab this when I am going for a work meeting or conference when I want to feel all so sophisticated. It really makes me feel really classy and all grown up like I am calling the shots especially when I pair it with some nice outfits. I also grab this when I am going for formal drinks or outings in the evening because I think it is well suited for these kind of events. I think this fragrance will forever have a special place in my heart because the Bae (he would roll his eyes at me calling him this but hey!!) got this for me for my birthday. I originally wanted to get the Peony and Blush Suede but we were told they were sold out in 100 ml. However, when I was looking around for something to try, the sales lady recommended this one. It was love at first sniff/whiff and I knew it was the beginning of a long love affair. I feel this fragrance embodies femininity, class and elegance all rolled into one. I cannot even describe how this fragrance makes me feel in one word. It's just one of those fragrances you can wear all year round and it would still suit every season. I reserve this for weddings, church events, parties, dinners and it always hits the right notes every time. Each time I wear this fragrance, I always get asked what I am wearing and how lovely it smells. It's just incredible and I love the final notes it fades into at the end of the day. 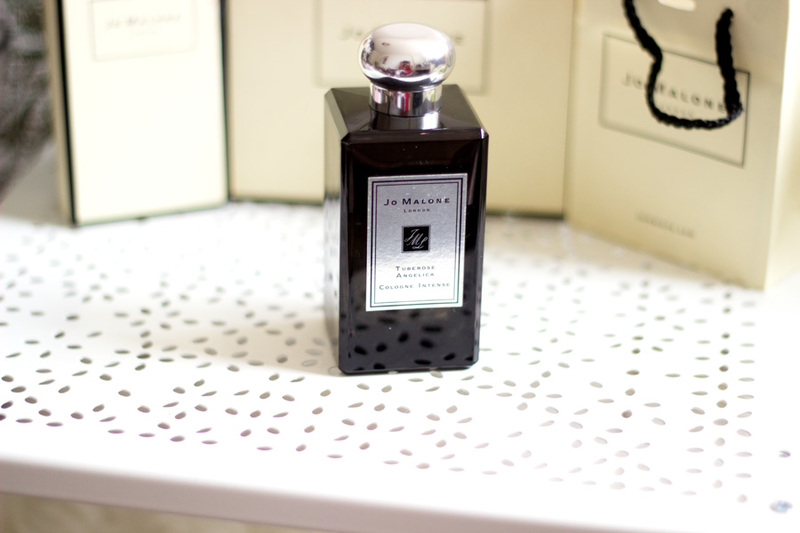 This is the first Jo Malone fragrance I purchased with my money and it was part of the Rock of Ages Collection. I actually was determined to purchase the Tudor Rose Cologne but I go derailed when I tried this out in store. It's the perfect Spring fragrance as it fells so fresh and clean. I love everything about it and if it were sold in 100 ml, I would have purchased it in a heart beat. I am using it rather sparingly because I don't want it to get finished at all as it is limited edition. I love to wear this for lunch dates and just casual events and it's the kind of fragrance any young lady will appreciate. I feel it embodies youth but with some sort of class that's rare with youthful fragrances. It's not as long lasting as the Cologne Intense range but you can still catch a whiff of it at the end of the day. It's also one I love to layer because it makes it even more unique than it already is. 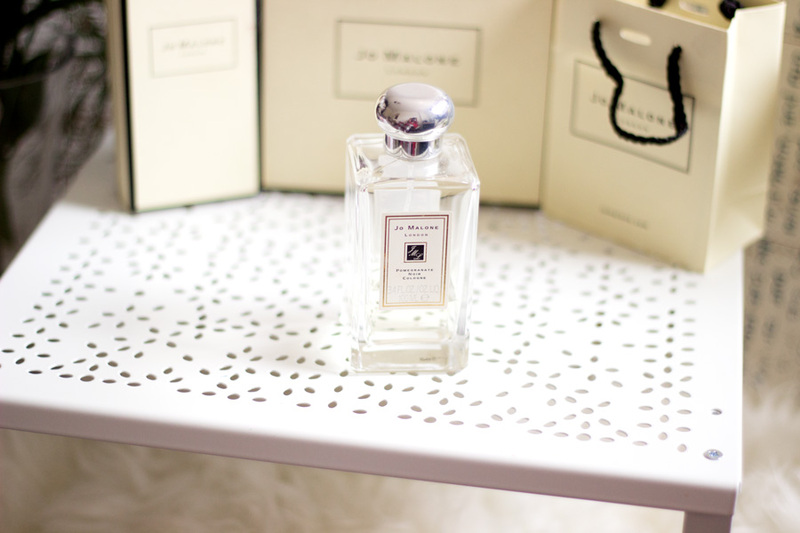 My friend definitely spoils me to bits with Jo Malone fragrances and I really cherish this particular fragrance. It was such a thoughtful gift because she knew how much I wanted Peony and Blush Suede. I cannot even count how many times I passed by this perfume and sniffed it. It always happened when I was in a hurry and very indecisive on parting with £40 for a mere 30 ml. However, my lovely friend surprised me with this fragrance as a birthday present. I was seriously over the moon and I am pretty sure I let out a scary little squeal. It had been on my wish list for so long and now it was mine. 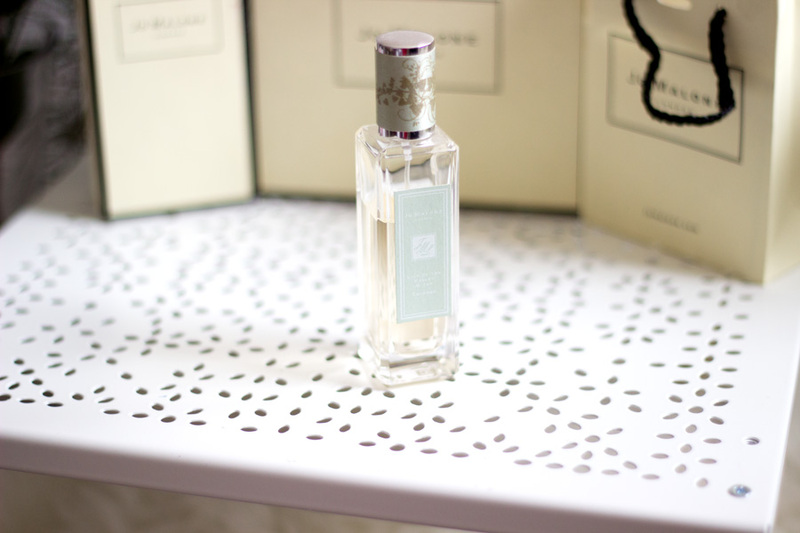 This fragrance is perfect for Spring because it smells of peonies as the name implies. It reminds of the fresh bloom and I love it so much. It is also a perfect feminine and youthful fragrance and I use this daily. The one thing I love about Jo Malone is the Hand and Arm Massages they offer when you purchase a product. I am pretty sure you can get one even if you don't purchase anything although I can imagine it may be a little awkward. Anyway, I got several little invites for these massages which I have used really well. I also signed up to my local branch's newsletter so I get invited to new launches complete with lovely treats, champagne and samples such as these lovely deluxe ones in this picture. Their samples are super generous and the packaging is amazing. I received this lovely 10 ml Pomegranate Noir Deluxe sample with the matching Body Cream. They are so cute that I have not even used them yet; it seems like a crime!! I also have several little 1-2ml samples which are always handy for my makeup bag and they have helped me decide what fragrance I want next. 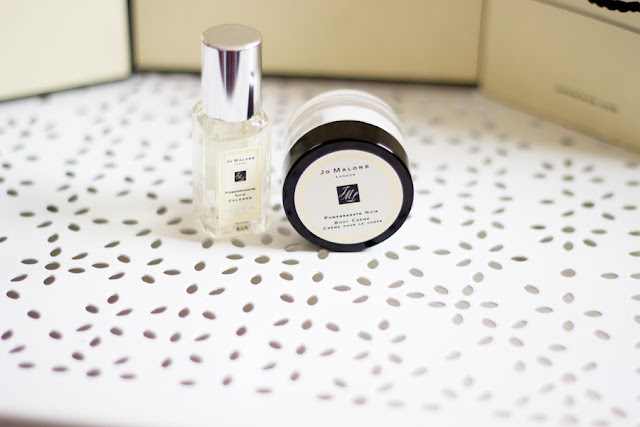 I don't think there are any rules for layering perfume although Jo Malone carefully selects fragrances within their collection which go best with each other. I have layered all the fragrances within my little collection at various points. However, my favourite combination has to be the "Queen-Tuberose Angelica" and the "Princess -Peony and Blush Suede" and No, I did not make these names up. That's exactly how the Jo Malone sales lady described them. She also told me how amazing they are when layered together so that's how I became addicted to the mixture. I can't even begin to describe how amazing it smells and they just work so well together. No one ever knows what I am wearing when I tell them to guess. I have also layered the Pomegranate Noir with the Lily of the Valley and it is the most sensual decadent fragrance mixture I have ever smelt. They are just so perfect together. I tried layering the Tuberose Angelica with Pomegranate Noir but I felt they were too strong for each other. The Peony and Blush Suede layered with Lily of the Valley is equally amazing!! 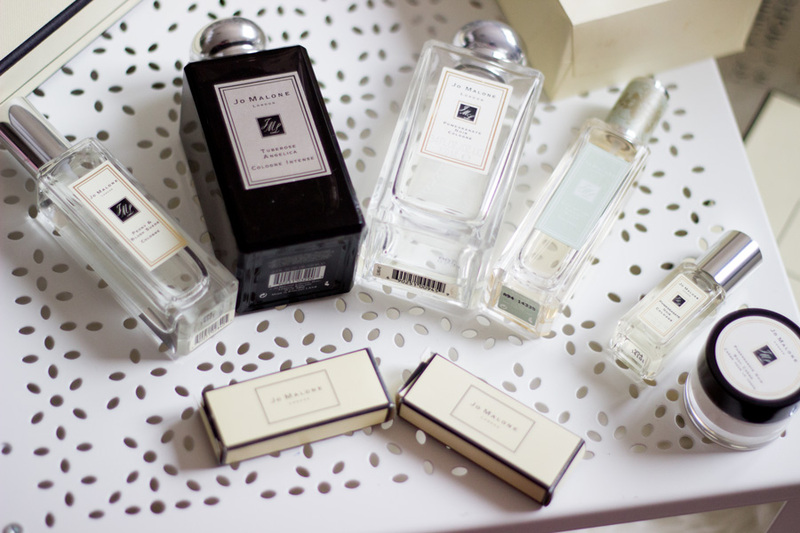 I am sure I don't need to point out that I am obsessed with Jo Malone fragrances. I just love everything about the brand. I am keen to branch out and try out their candles. They are super expensive but I know they would be well worth it. I am also looking to add two more fragrances to my collection (I know!!). The thing is once you try Jo Malone Fragrances, it seems like there is no going back. The two fragrances on my list right now are the Jo Malone Plum Blossom Cologne (it smells too incredible for words) and Jo Malone Red Roses but I would get them from Duty Free because Jo Malone never does discounts. Everyone seems to be talking about Jo Malone Blackberry and Bay so I need to catch a whiff of it next time. 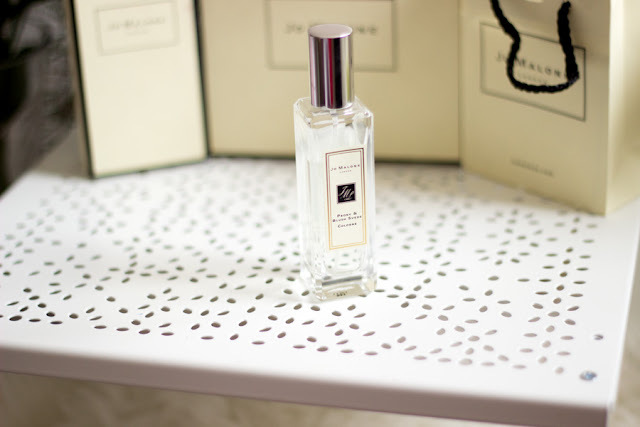 The Jo Malone Wood Sage and Salt was very hyped but it is not really my kind of fragrance so I always suggest you try and sniff these fragrances before you commit to purchasing them. That's pretty much all for today? 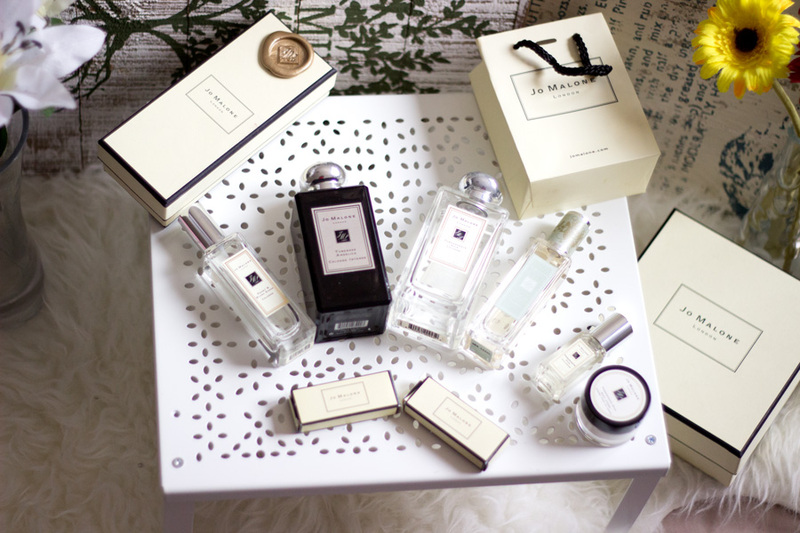 Have you tried anythign from Jo Malone? I feel like I have been away for ages when it has only been less than a week. I just decided to take a teeny weeny break and just relax over the bank holiday weekend. I hope you had a lovely weekend (and bank holiday if you are in the UK). It has been a minute since I did a Makeup Revolution Haul in fact my last one was last year over here. I featured some of these products in my drug store haul but I though this was the best time to review them in depth as I have tested them out for a little while. 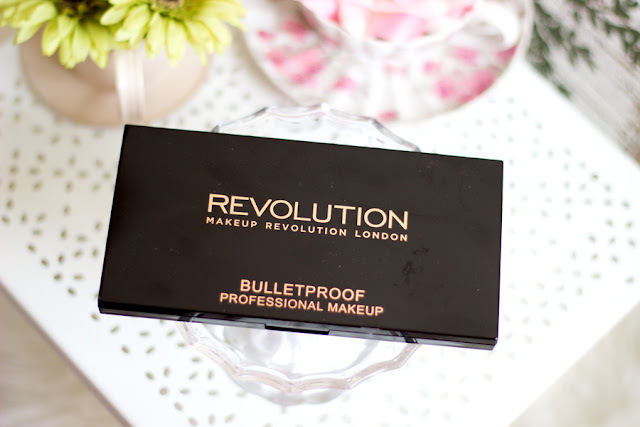 I am sure everyone and their dogs and cats must have heard about Makeup Revolution especially if you live in the UK. They literally took the blogging and makeup world by a storm. I love their products because they are good quality and affordable and mostly, I love how innovative they are. They make several dupes for other high end brands which is really impressive. I thought I may as well give myself a little treat especially as Superdrug was having a 3 for 2 offer which is one of my favourite offers in the drug store. I picked up the Makeup Revolution Ultra Brow Kit, Makeup Revolution Mermaids vs Unciorns Eyeshadow Palette and the Makeup Revolution Double Flick Eyeliner. 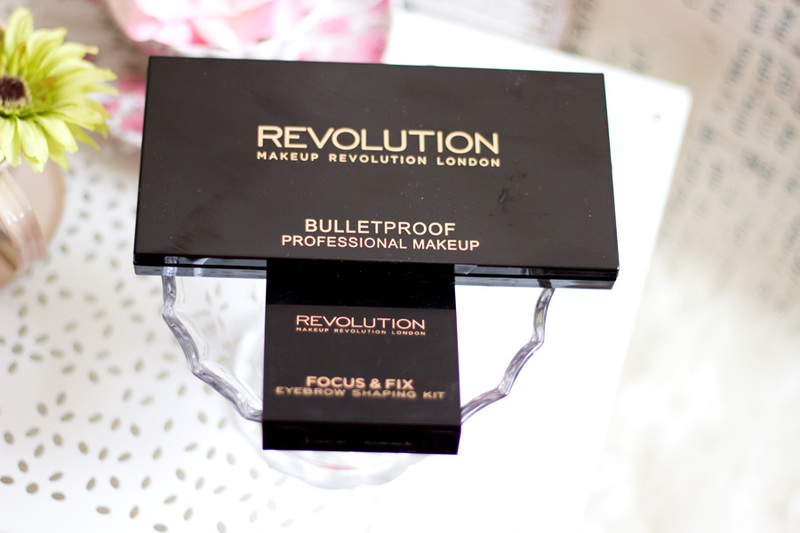 I am really impressed with Makeup Revolution packaging because they are all so sleek and sturdy. I honestly don't understand how they have such good packaging and good quality products and still manage to keep the prices super affordable. Although some of the packaging looks slightly bulky, I find them easy to travel with because they are slim and fit well into my luggage. They also shut securely so there are no accidents at all. 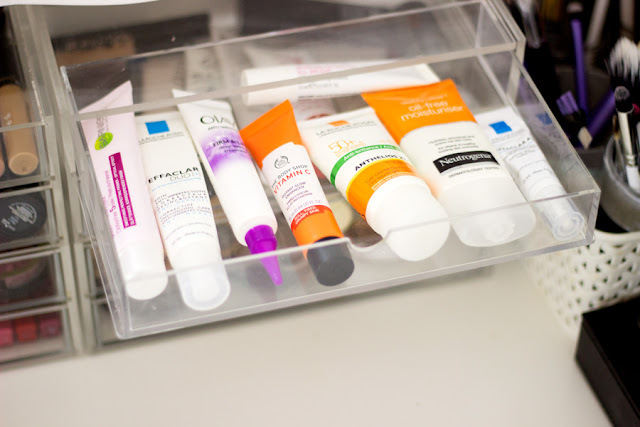 I travel at least once a month so I am always keen to have makeup products with good packaging as they are the only ones that come with me in my carry-on luggage.. 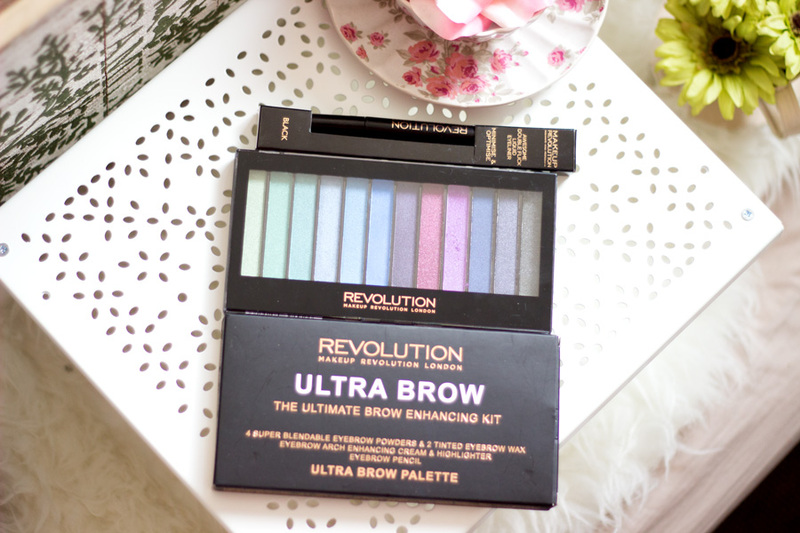 I already had the Makeup Revolution Brow Kit which I purchased last year and I have enjoyed using it but I just wanted something with more products to play with. 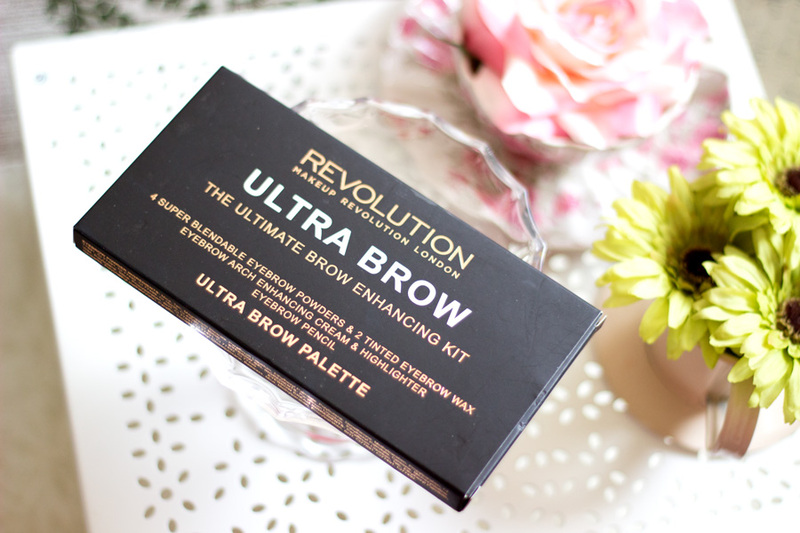 I had read a few reviews for the Ultra Brow Palette and I thought it would be a nice addition to my kit. I figured I could use some of the brow shadows as eyeshadows, particularly as crease colours, if they don't work well on my brows. 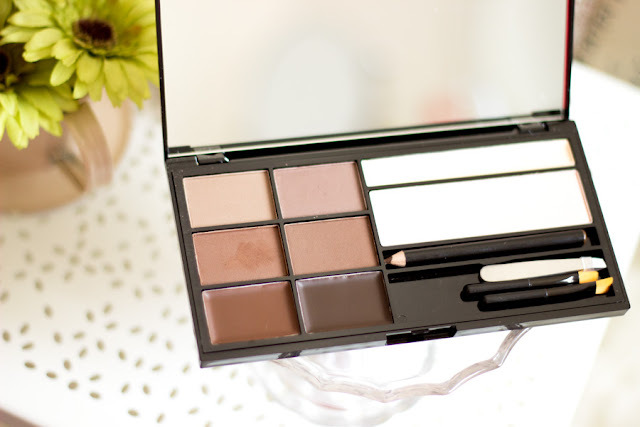 I love how much products you get in the palette as they are very versatile and can work well on various skin tones especially if you are a makeup artist. I chose the shade Medium-Dark because I have darker skin and the colours inside seemed to look more appropriate for my skin tone. 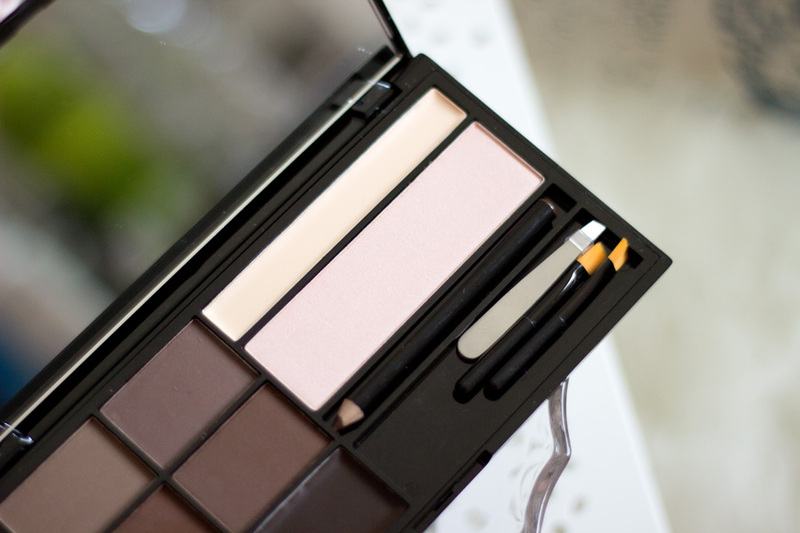 In the palette, you get the following- Two Eyebrow Gels/Wax, Four Eyebrow Powders, an Eyebrow Arch Enhancing Cream and a one Powder Highlighter. You also get a Brow Pencil (for outlining) and some tools (brushes and tweezers). I never really have any much use for these tools so I always bin them. 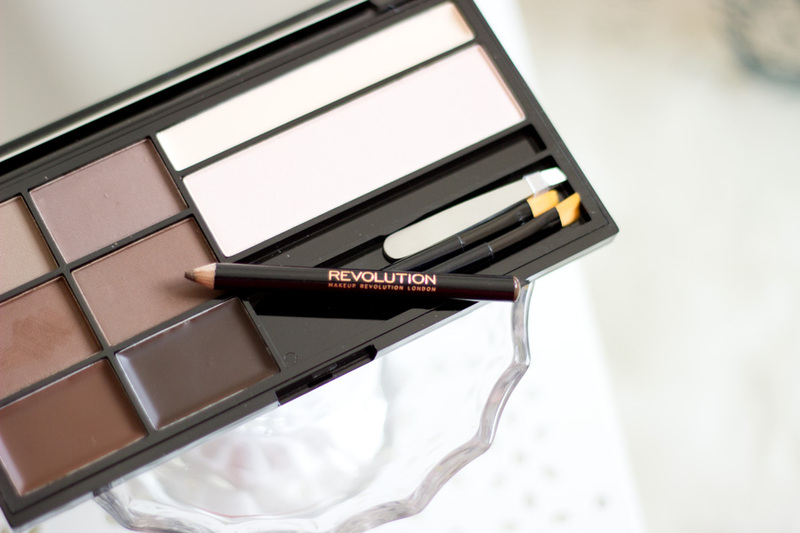 I love the combination of products because they will always work with any kind of brow look you are going for. I only actually use the darker eyebrow gel and the darkest brow powder. The highlighters are way too light for me although I think I may try one as an eyeshadow base to see if it would help my eyeshadows pop (Update: Nopes, it did not work out at all). However, I like the eyebrow pencil which is dark enough to outline my brows (hallelujah!!). I still plan on using the other eyebrow powders as eyeshadows although they have a little bit of fall outs which is slightly frustrating. 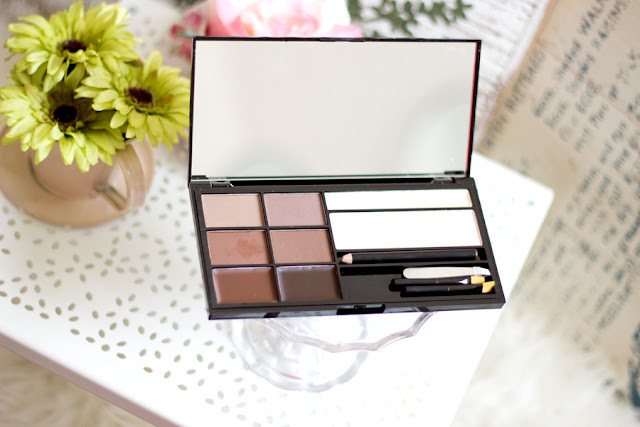 All in all, I think it is a great brow palette especially at the price of £7.99 and I have not seen anything similar with the same price. If you saw my recent Spring Makeup Essentials post, you would have seen that I have now reignited my love for eyeshadow paletttes with bright colours. 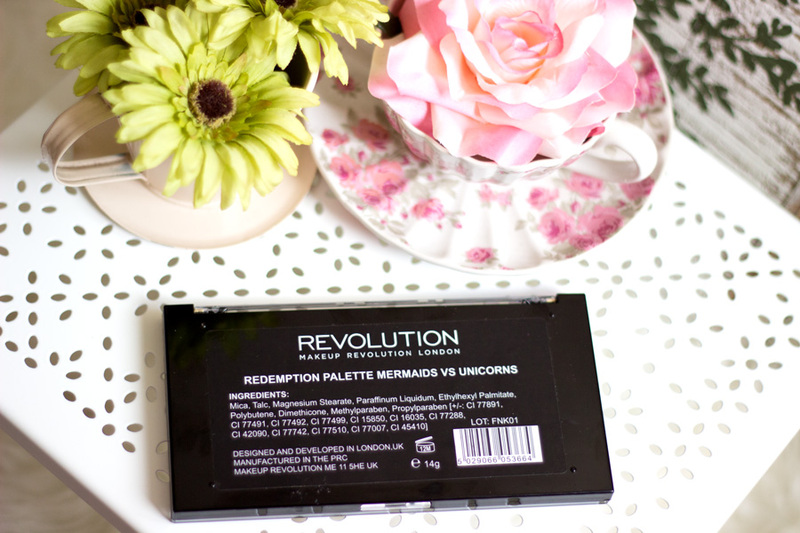 I saw this lovely Makeup Revolution Mermaids vs Unicorns Palette in Superdrug and I knew we would have such an amazing time together. It has more cooler eyeshadow colours than warm bright spring ones but I still like it a lot. In this palette, you would find various shades of green, blue, purple, pink and greys which makes it perfect for both sunny and autumnal weathers. 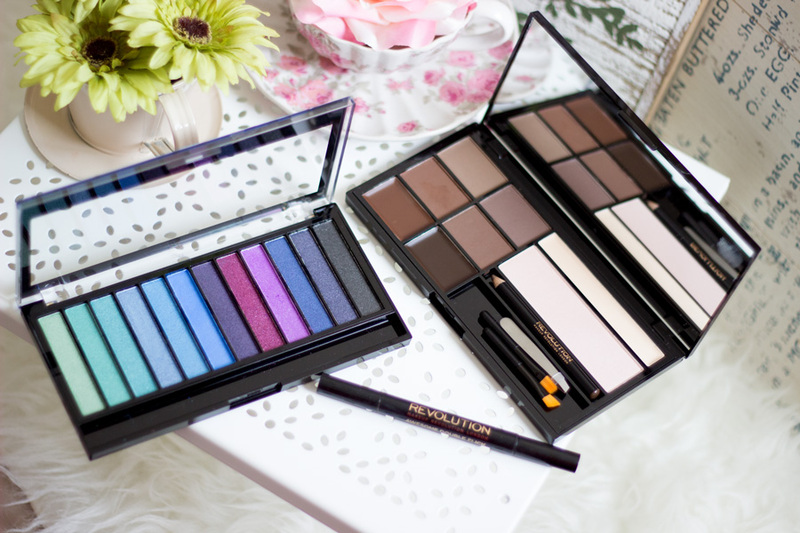 I find that it would go really well with other warmer eyeshadow palettes in my collection. 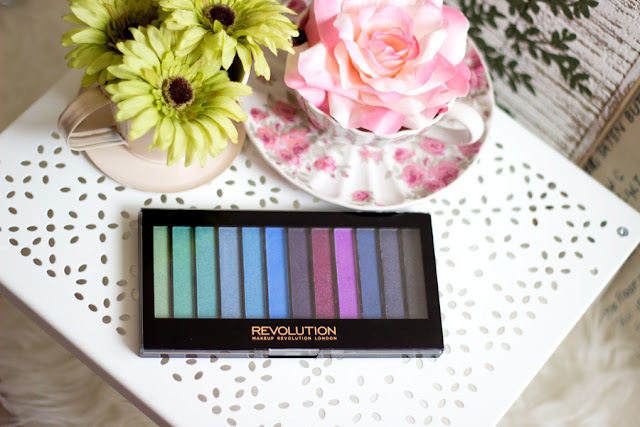 As with many Makeup Revolution Eyeshadows, they are well pigmented and the colour pay off on the eye lids is quite impressive. 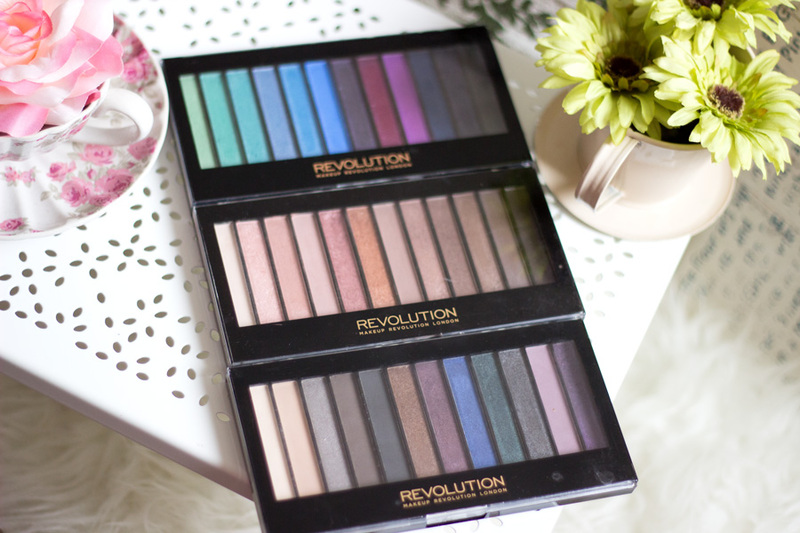 I find that this palette has some fallout which is not uncommon with some Makeup Revolution Eyeshadows I have tried in the past. 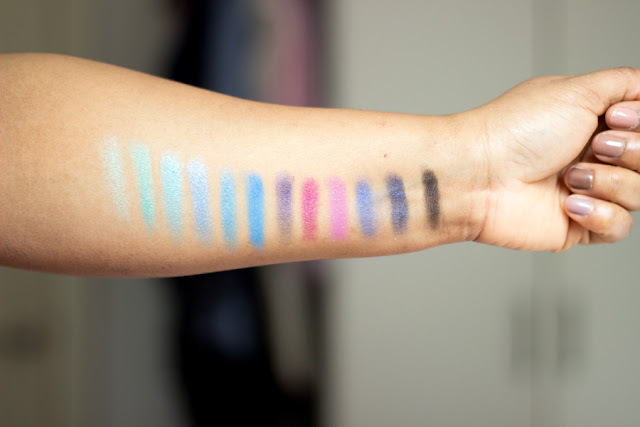 However, I don't think this is too much of a problem because it can be mitigated by using the eyeshadows wet and/or tapping off any excess eyeshadow from the brush before application. I love to use eyeshadows wet because it also intensifies their pigmentation and helps them adhere better to the eyelids. Most Makeup Revolution Eyeshadows I have tried have really good pigmentation and this one is no exception especially with the array of colours in the palette. 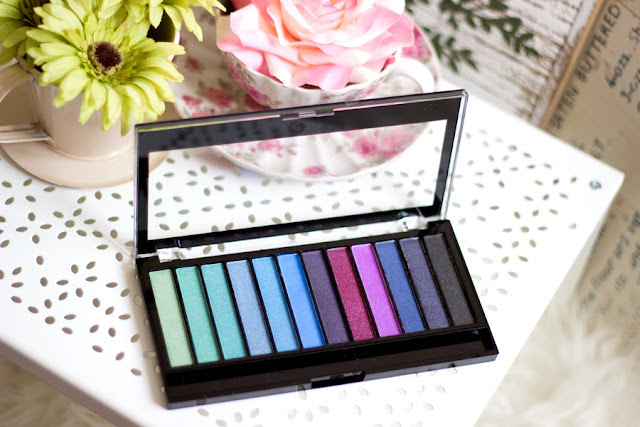 I know the bright colours in this eyeshadow palette may not be everyone's cup of tea because they are quite bright but they do complement each other and you don't have to use all the colours. 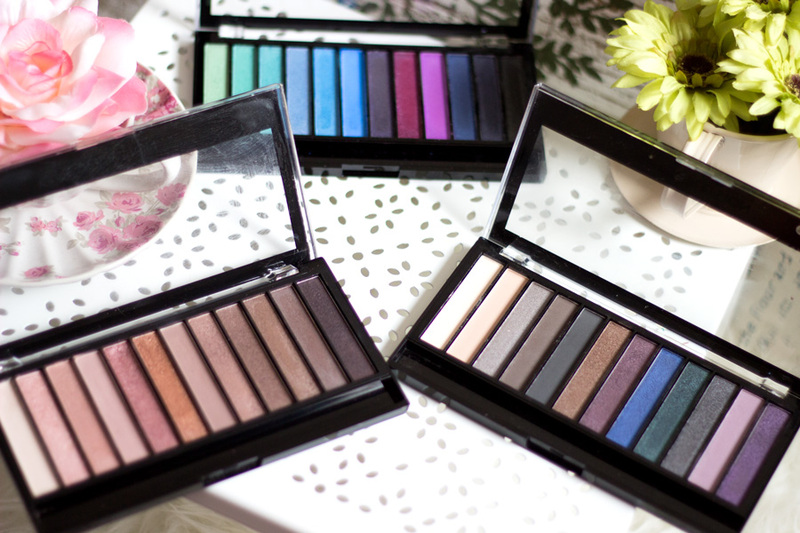 Besides, life is too short to use only neutral eyeshadow shades you know. It's always good to experiment as I am pretty sure some colours look good on some people and not on others; you just have to find what works for you. 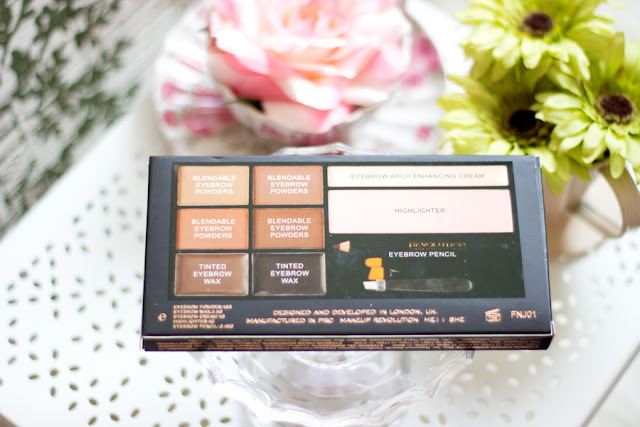 Although I got this palette to do more Spring Inspired Tutorials, I feel it would serve me well into Autumn because it has such lovely jewel tone colours. I really enjoy using this palette although I have to mention the glitter coupled with the fallouts could be a little annoying. I find that even using the eyeshadows wet has little effect on reducing the glitter but I guess that's the style of the palette. Let's just say I am an eyeliner junkie and I can't be without my eye liner. Even if I don't have any sensible makeup on, I always have to have my eye liner. I feel it defines my eyes and gives them some character. 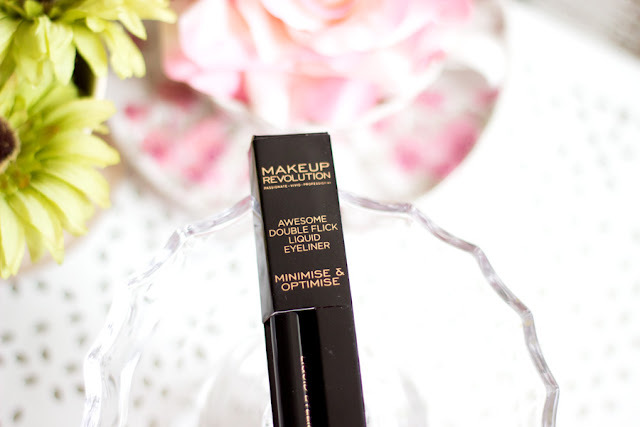 L'Oreal Eye Liners are my Holy Grail Mascaras and I have used the for ages. 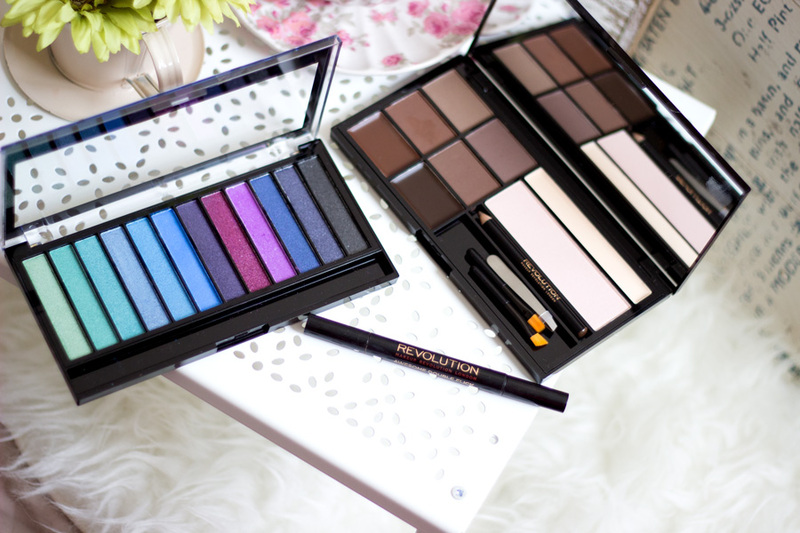 I feel they are the best in the drug store and my absolute favourites. 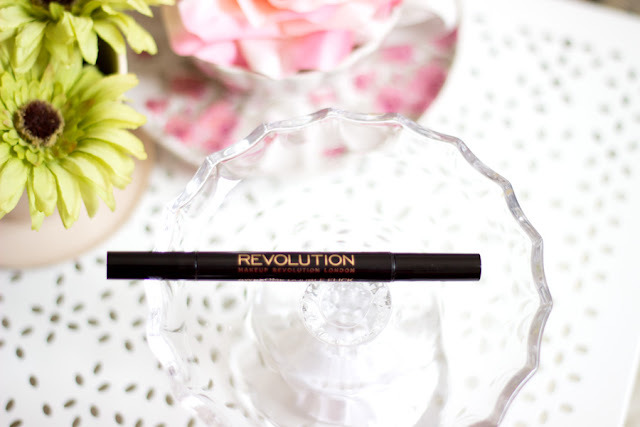 However, that has not stopped me from giving other brands a chance hence why I picked up the Makeup Revolution Double Flick Eye liner. The fact that it was double ended was the selling point for me as it is versatile and you can achieve various looks with it. 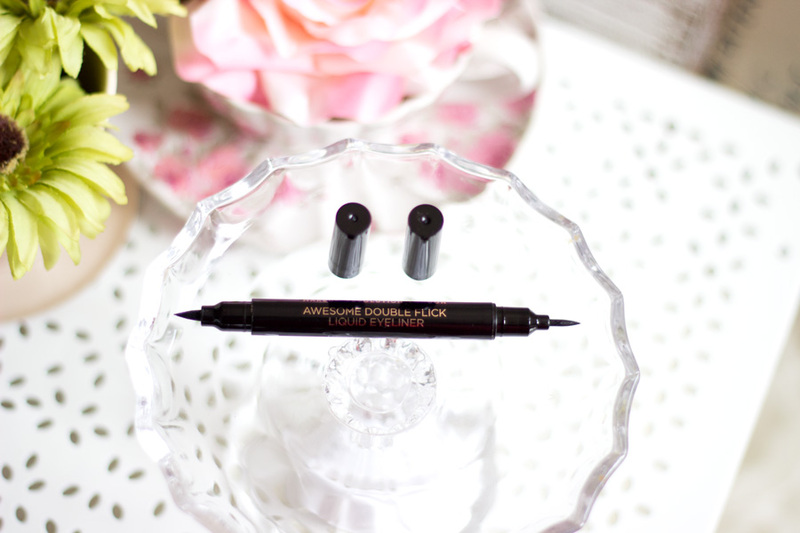 It has a thin end which can be used for more precise cat eye flicks and there's the thicker end which can be used for thicker cat flicks. I think it is a great eyeliner however it does not last as long as my L'Oreal Eye liners or even the Collection Extreme Eyeliner which is pretty sad. I find that it smudged really easily which is such a no-no for me. I am not sure if it's the fault of my sensitive eyes or may be my application. I will give it another go and report back on how I feel about it. I actually really like it and I honestly wish it applied and lasted better. I will try and change my technique to see if there is any chance for improvement. However, for the price and the double ended side, I think it's really good value for money.